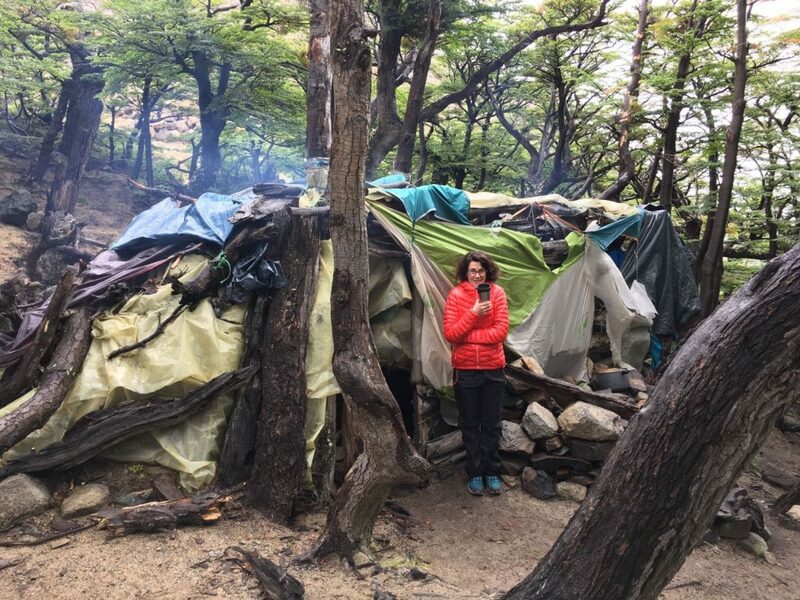 In 2017 Swoop customer, Sarah, ticked Patagonia off her list of must-visit remote wilderness destinations, having already visited Mustang, Nepal, and the Simien Mountains in Ethiopia. 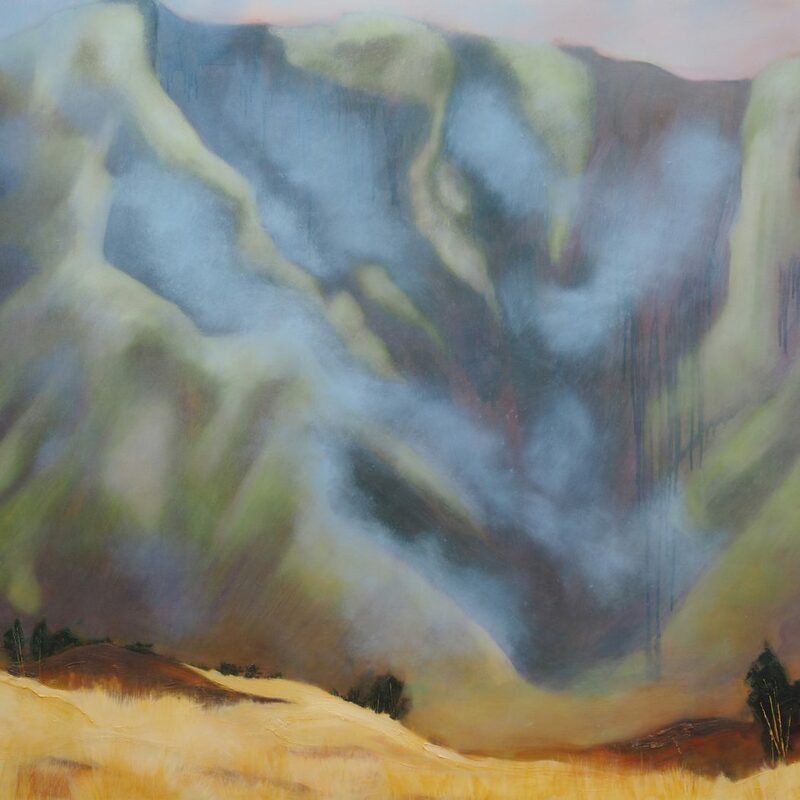 On returning to her artist’s studio after each trip, she attempted to translate onto canvas her experiences of the landscapes she had seen. 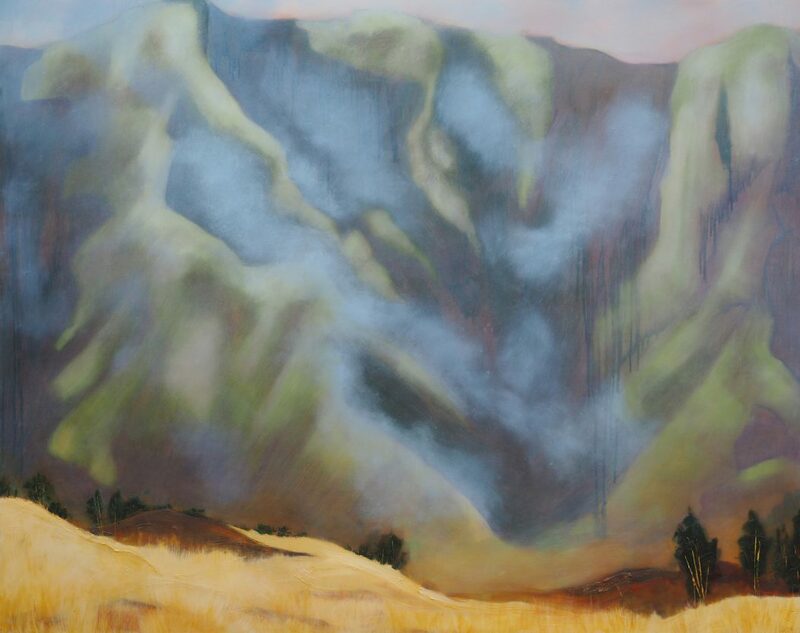 Here she talks about the challenges of painting the sublime and capturing the essence of such unique landscapes. Why does the landscape of wilderness appeal to you? Maybe it is because I live and work in London that I am drawn to the uncompromising remoteness of these wild places. Figures have no place in my paintings. It is the innate immensity of history – and prehistory – embedded in these extraordinary places that excites me and informs the narrative in my work. An oil study for the finished painting – a looser, more immediate response to the composition. 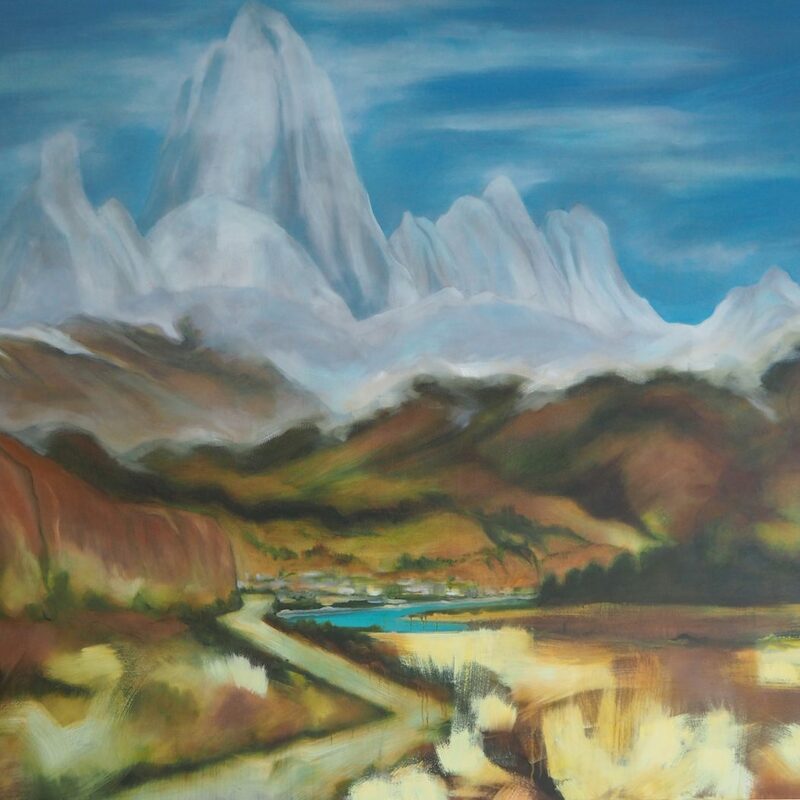 The finished painting, built up in layers over time, has a richer palette and emphasises (exaggerates even) the divide between the unattainable snowy peaks of the Fitz Roy range and the rugged but more approachable foreground. 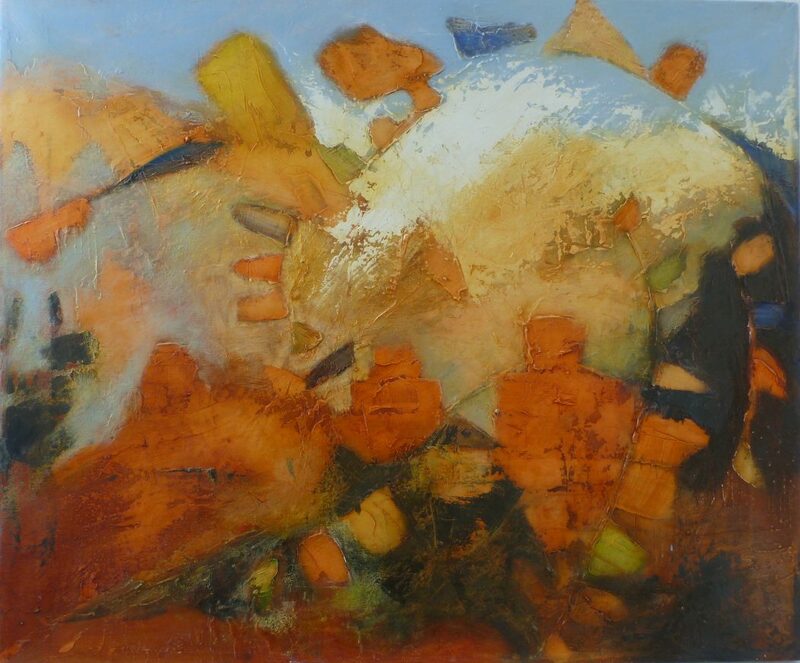 In the painted version, the image becomes less literal, an abstracted version, emphasising the colours – the red earth and buildings contrasting with the icy blue sky. Rising dramatically above the lowlands. 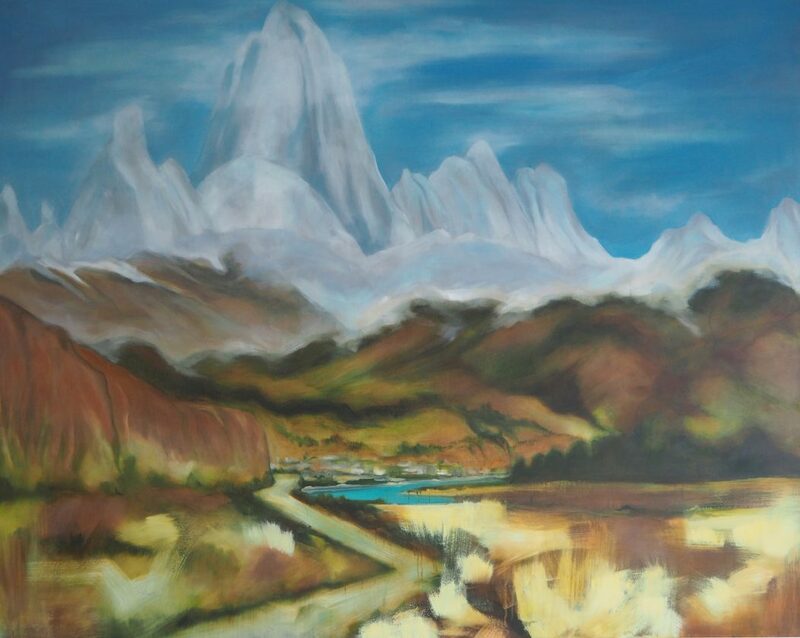 In paint the ethereal sensation of the landscape is magnified, the looming mountains solid and yet intangible. Divided into clearly differentiated bands of contrasting colours. 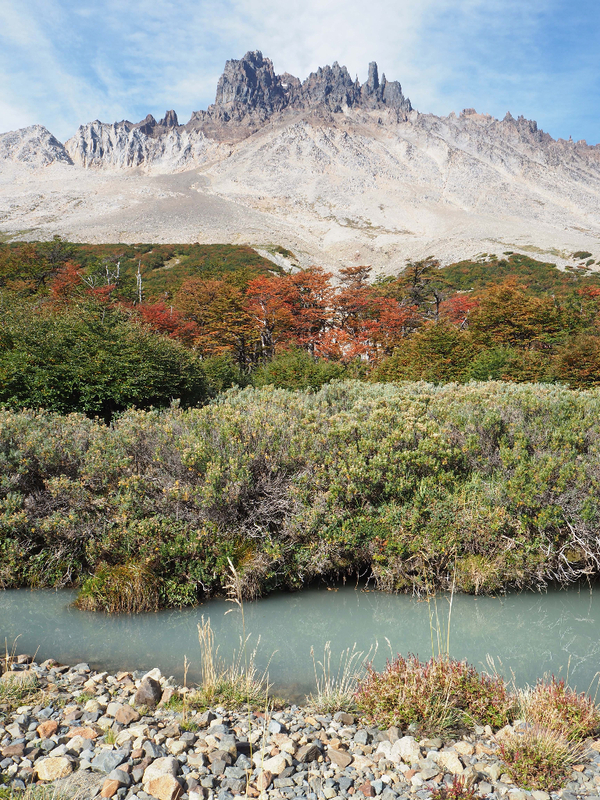 The autumnal reds of the lenga forest stand out against the dark mountains in the distance and the vivid blue of the foreground river. Enjoying the company of the lenga trees! 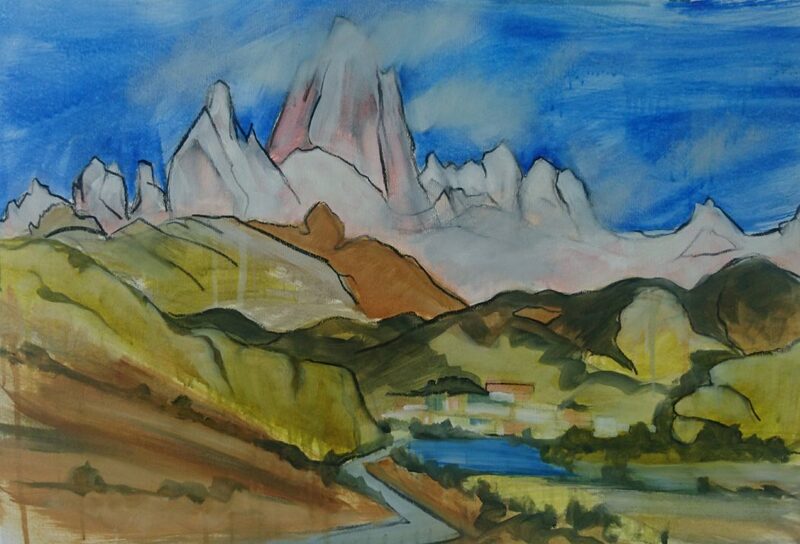 How do you go about painting the landscapes you visit? There’s never time to draw or paint when I’m travelling, so I take a lot of photographs, and write a stream-of-consciousness diary at the end of each day, both of which feed into what I do. Then, when I return home, I plaster my studio top to bottom with photographs and immerse myself in that for some time. 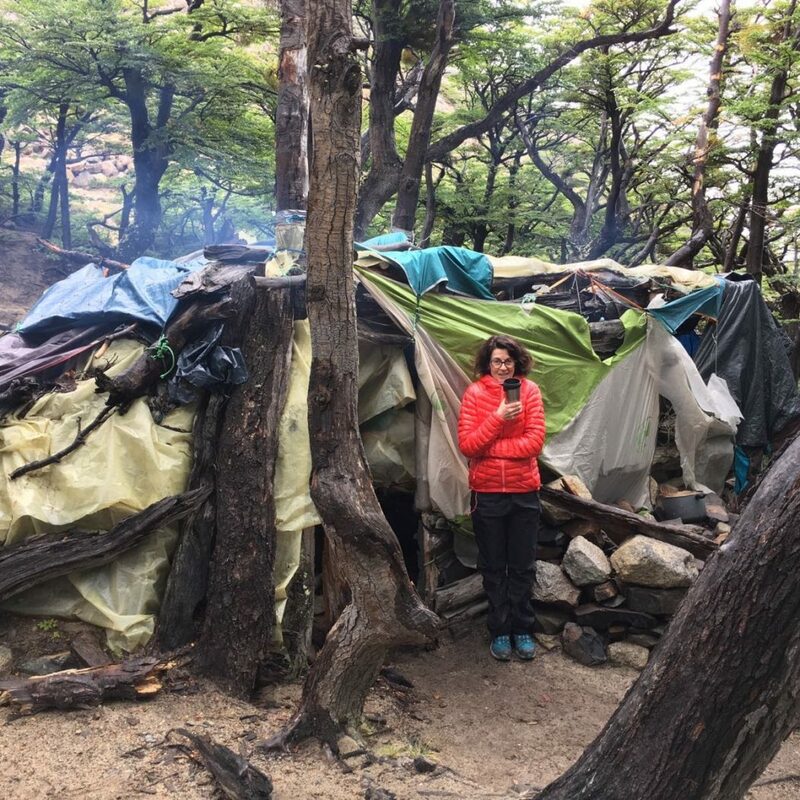 It takes a long time to process the information mentally – a year on from visiting Patagonia I am still grappling with how to represent the unrepresentable. I’ll do lots of oil studies, trying to get an idea of composition and the things that might work. Then when I embark on full-scale paintings, I like being able to move the paint around, building up layers of colour and scraping off things I’m not happy with. I love the way that you get traces left, ghosts of the previous layers. There’s a lot of serendipity involved, and as the paintings develop, they can become less literal. Surface interest is also important to me – the transparency of thin layers, and the texture and opacity of more chunky impasto. What elements of the landscapes have you tried to capture in your work? Above all else in Mustang I remember being incredibly cold a lot of the time and I hope that iciness comes through in my paintings. 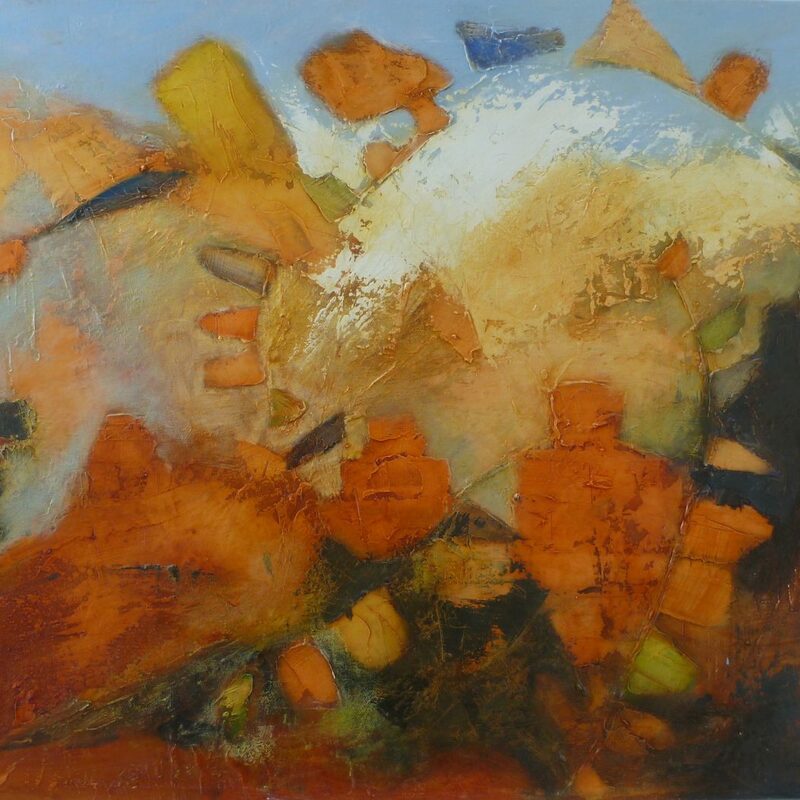 I tried to remember that physical experience as I painted and used a palette that conveyed that sense of cold. The landscape is very dry and there is a rich red dust (traditionally a hot colour), but there is also a very icy blue of the sky, so maybe the juxtaposition of the two is what makes it work. In Ethiopia, we trekked first in the high escarpments looking down at the plains below, then dropped down to walk underneath, looking up. There is a vertiginous vertical drop of around 2,500m from the top peaks to the lowlands – being at the bottom of that drop provokes an extraordinary sensation. The thin air and cold nights made it quite hazy (we were there in March) and it felt rather ethereal, which is what I’ve tried to convey in my paintings. In Patagonia you have a different landscape everyday and there are fantastic contrasts – from the intensely vivid milky blue lakes to the autumnal colours of the lenga forest. 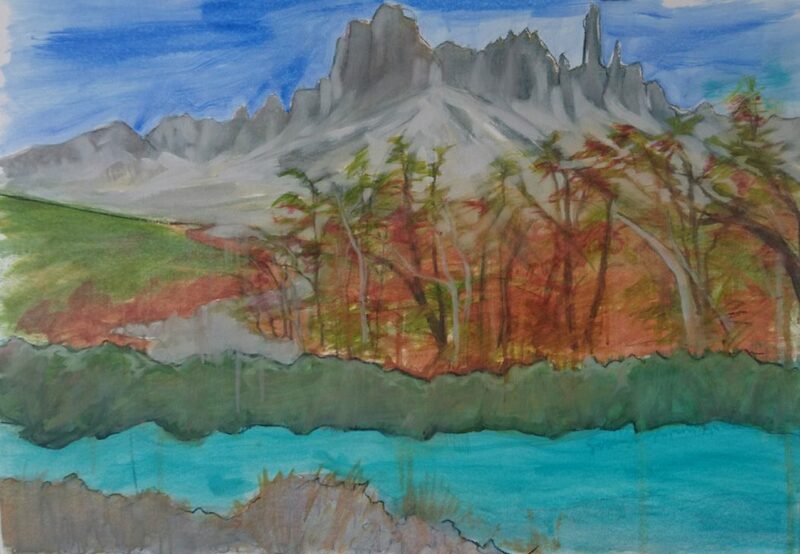 I’m fairly obsessed with trees – I’ve painted several tree portraits – and everywhere in Patagonia there is lenga forest. It was getting quite red by the time we left. I was struck by the varied growing habits they have – you get some enormously tall ones, and then some small, stubby ones, growing close to the ground. You’ve travelled to some very remote places. How did the experiences of travelling in the different wildernesses vary? 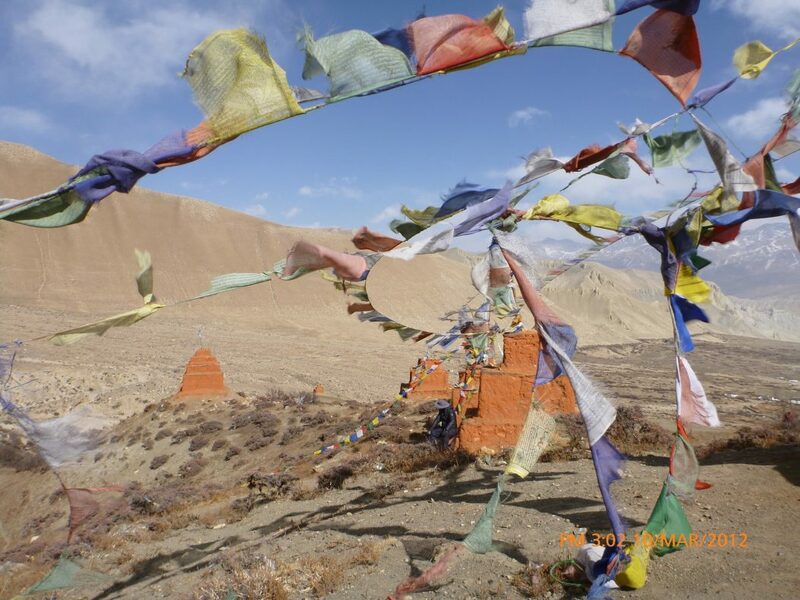 Upper Mustang is a restricted trekking area and visitor numbers are very limited, something which appealed to me. 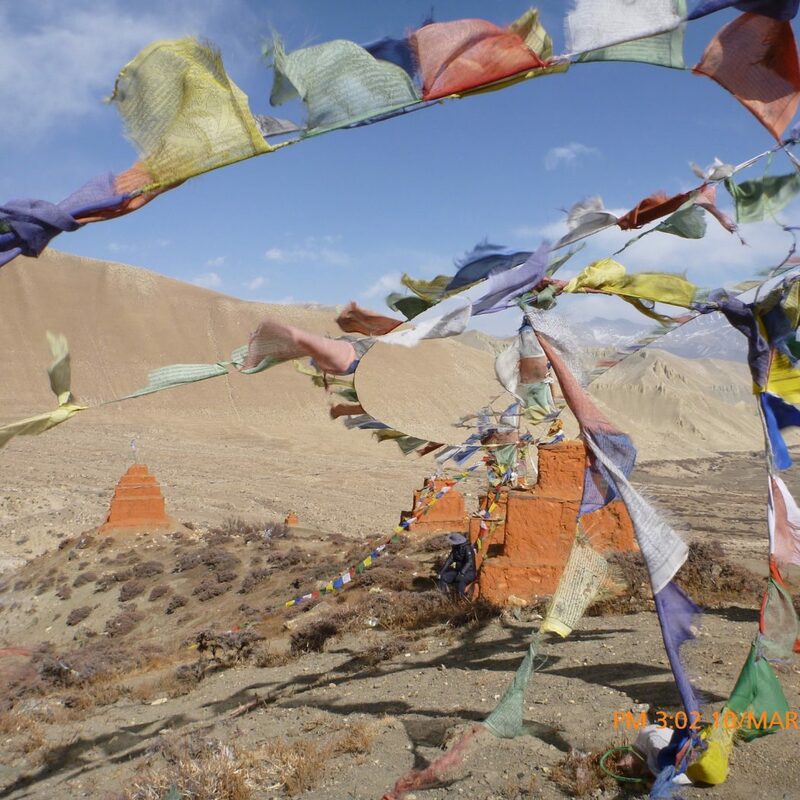 We were accompanied on our trek by a ludicrously large team of porters carrying tents and all our food – the cook had about 20 foot-square trays of eggs stacked together in a bundle! We had deliberately gone a bit pre-season to avoid other travellers, so the tea houses [small hotels known as bhatti in Nepalese] weren’t open yet. We therefore found ourselves quite often being invited into people’s homes where we were camping. Everyone lives, eats and sleeps in the same room of these mud buildings – a dung fire would smoke away in the middle of the room, with mud benches built around the edges with rugs on where the family would sleep. 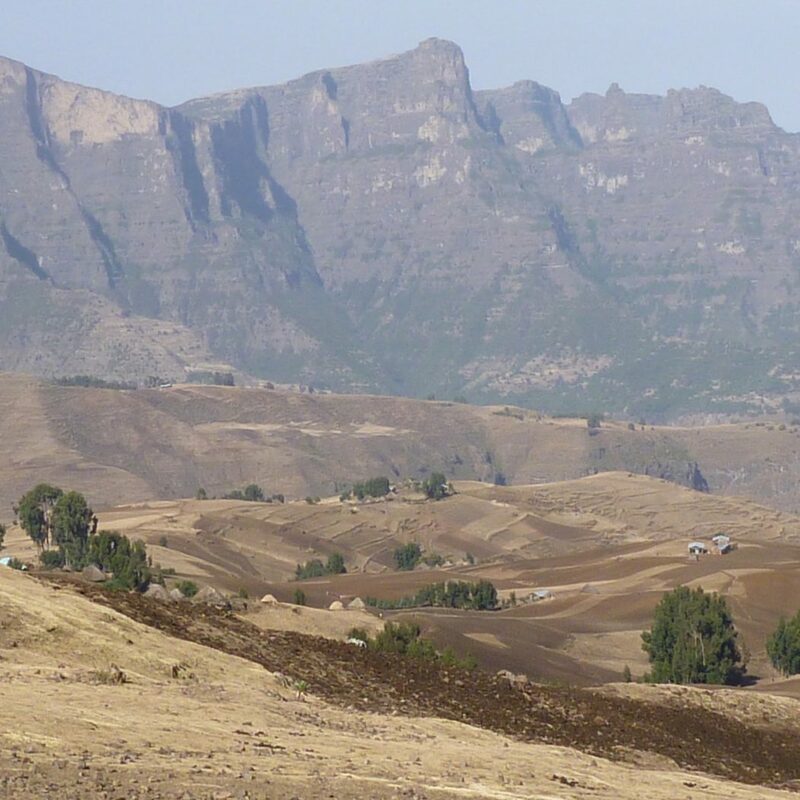 In the Simien Mountains, although the region has relatively small numbers of visitors (we saw at most a dozen non-local people during our trip), it is quite a populous place – it could be difficult to find somewhere to pee behind a bush without a small child herding goats popping up. We had a guide and an (unnecessary, or so it felt) armed guard accompanying us, as well as porters. We created interest amongst locals wherever we were, but particularly when we were in the lowlands, where there are no campsites and visitors are a real rarity. 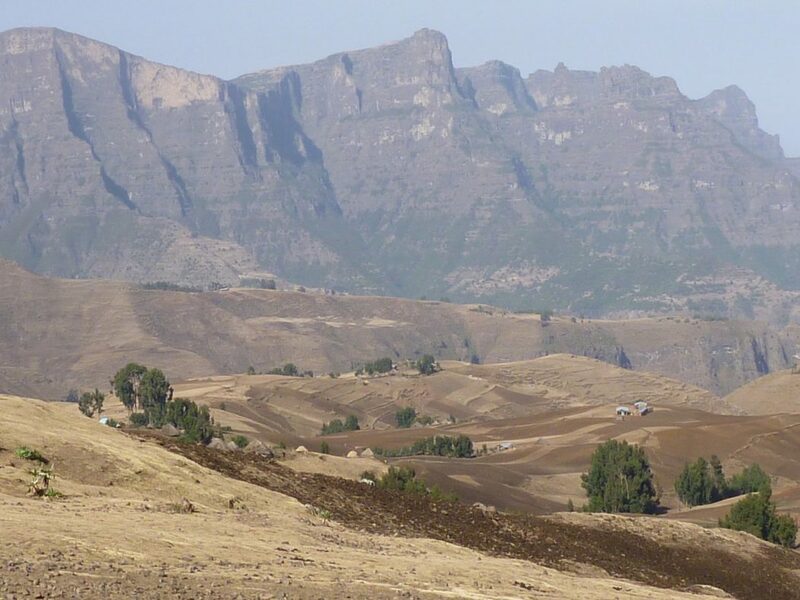 Both Mustang and Ethiopia were very much developing countries when we visited, where there is no sophistication, no electricity or water, in extraordinary landscapes. In contrast, in Patagonia you’re in an extraordinary wilderness, but it’s within very modern countries and communities – it’s an odd dichotomy. We knew that it would be more busy than the other destinations, so deliberately chose to go at the end of the season and camped in slightly off-the-beaten track sites where possible. 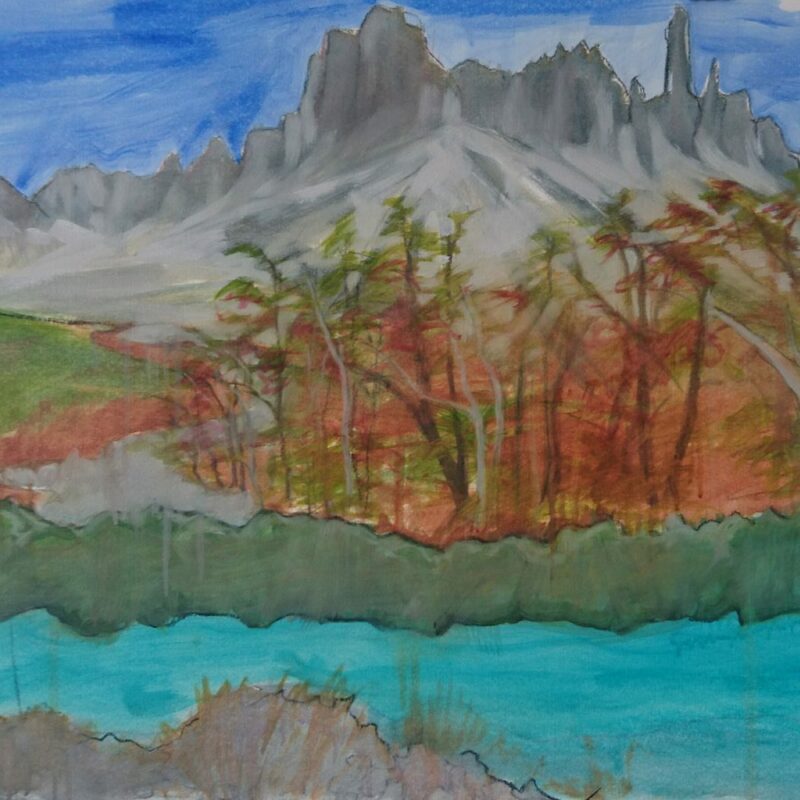 What effect does painting the landscapes have on your experience of them? 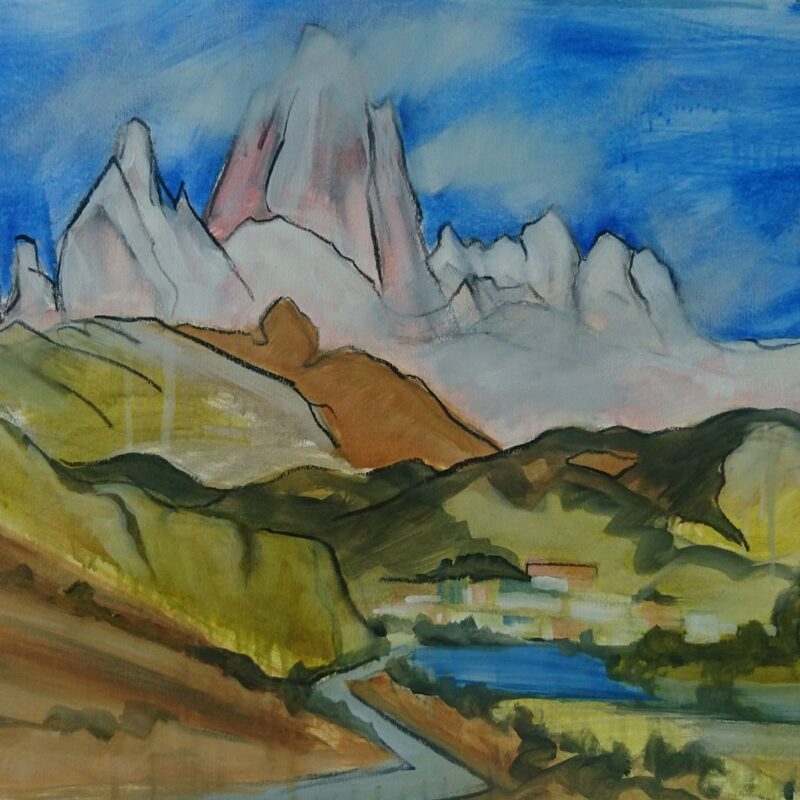 The process of painting changes how you see a landscape. When you’re there, you’re constantly trying to make mental recordings of where you are and imprint a sensual record of the place; in the studio, it’s trying to recreate that, trying to dredge up all the memories and feelings and emotions with the help of the photos and the diaries and trying to relive it. So, making the paintings makes it more vivid for me. When you return from the landscape there’s a time of ‘mourning’, a sadness that you’re no longer there. It makes you reflect on the passing of time, as you wonder if you’ll ever return. 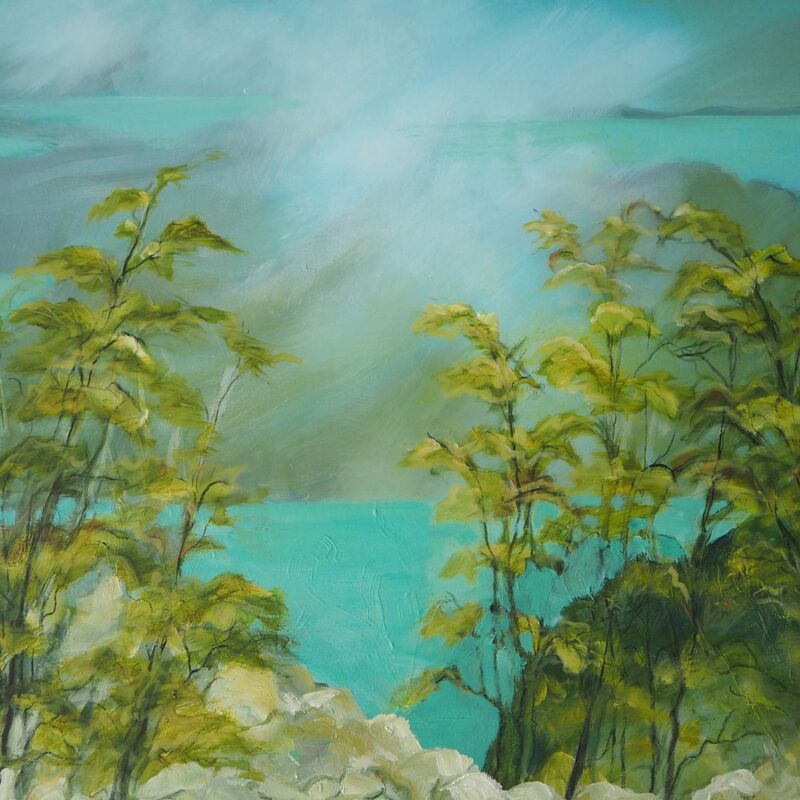 Sarah Tilley is a landscape artist living and working in London, who enjoys exploring wild places on foot with her husband Charles. She is looking forward to their next adventure together and the challenges of painting a new wilderness. 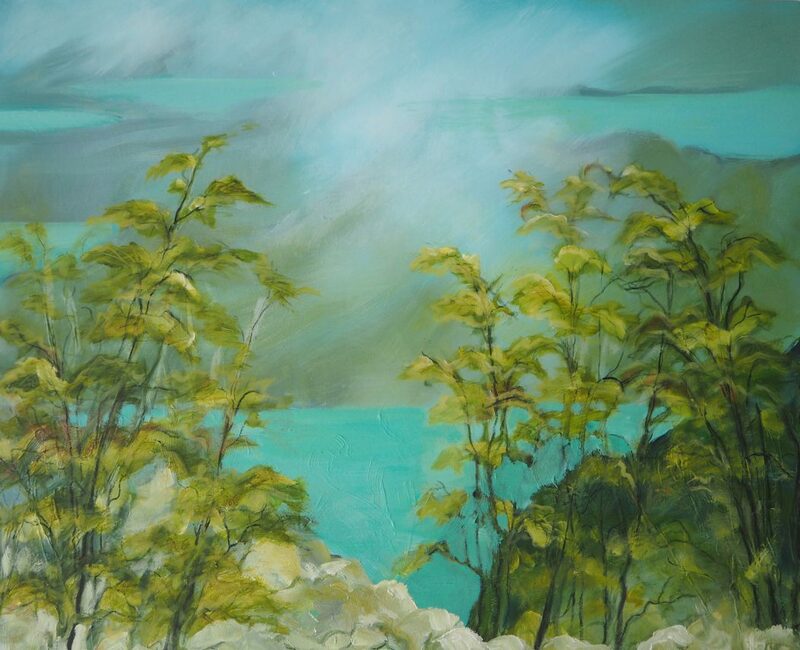 You can see more of Sarah’s work on her website sarahtilley.co.uk or meet her and some of her paintings in her studio at the Wimbledon Art Fair from 10th - 13th May 2018.